Hey guys and girls, and whomever else reads my blog! Just sharing a quickie today. I love quickies! :) I also LOVE the Dollar tree. I can always find something useful or something fun to do in terms of a craft. These are the Before…not so cute huh? 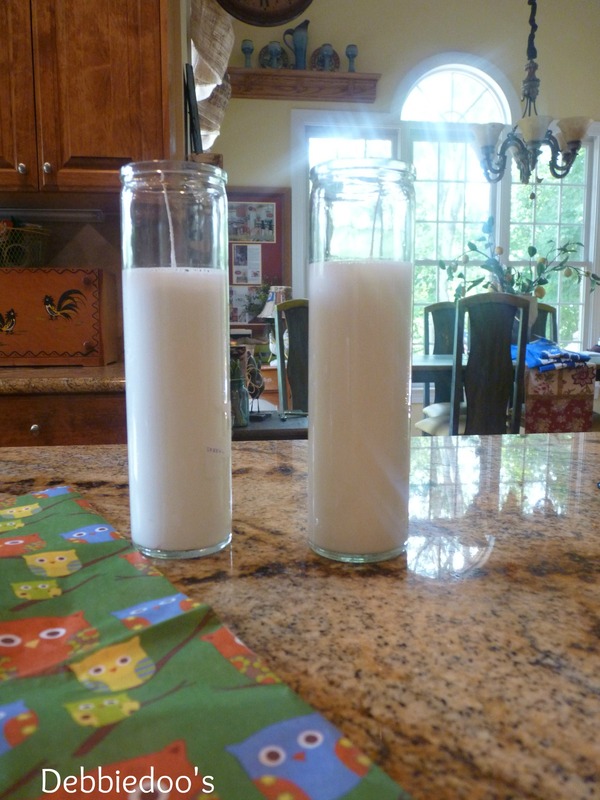 You may have seen these tall candles before at the Dollar tree. I used them last year for our Valentine Mantel. But I never use them as looking plain. These are not even completely dry! I am patient like that! Actually I wanted to get outside and take these snaps before it rains again. 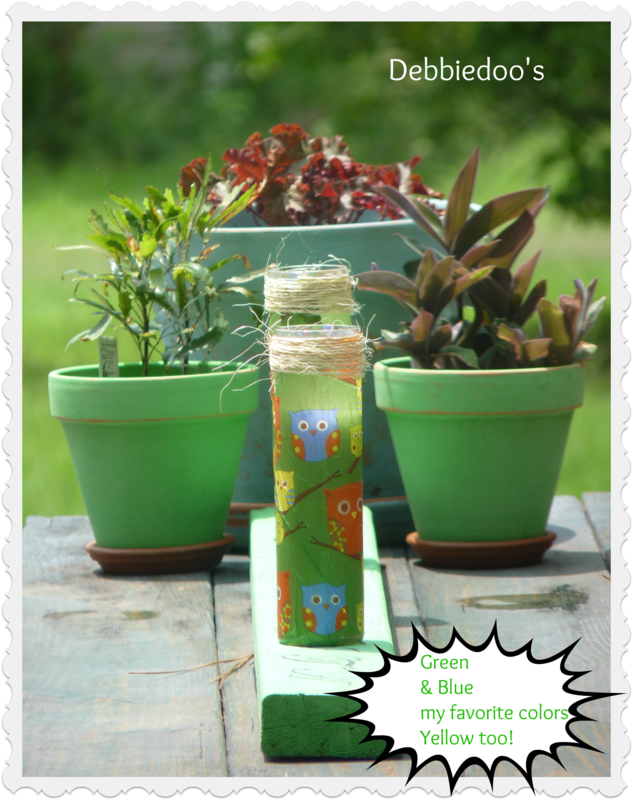 There is my quickie mod podge dollar tree craft for the day! I think I have done enough projects for the week. See you Friday for my featured home tour. Don’t forget about the copy cat challenge coming up next WEDNESDAY. I love a quick and easy project too. Yours came out super cute. You are crowned the Mod Podge queen. I haven’t used that stuff in so long that it is probably dried up. Cute paper. Those candles are great for dressing up, Debbie! I’ve done a few over the years myself. They also make great gifts. 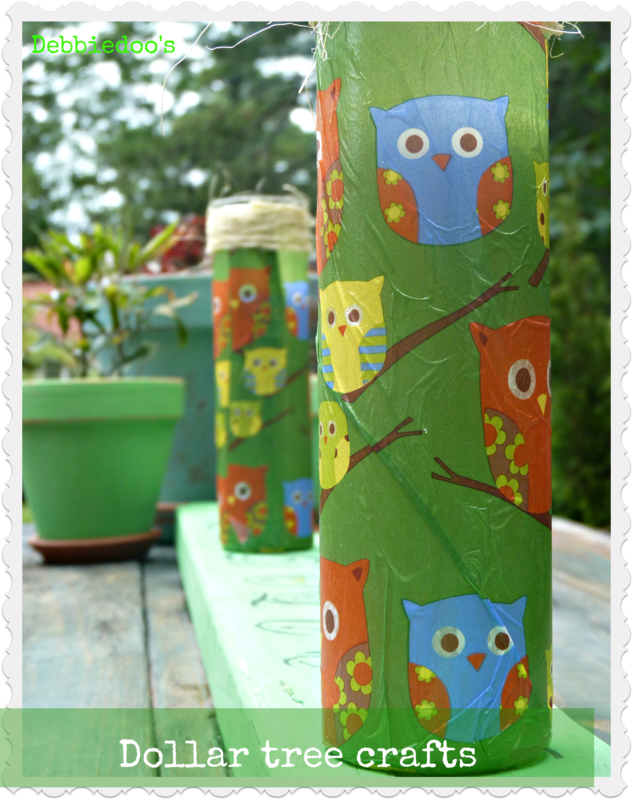 Cutie “hootie” owls…love this Debbie…so easy and turned out great. Love those candles! I use them for so many things. Yours are so cute mod podged with the tissue paper, what a great idea! These are so cute! 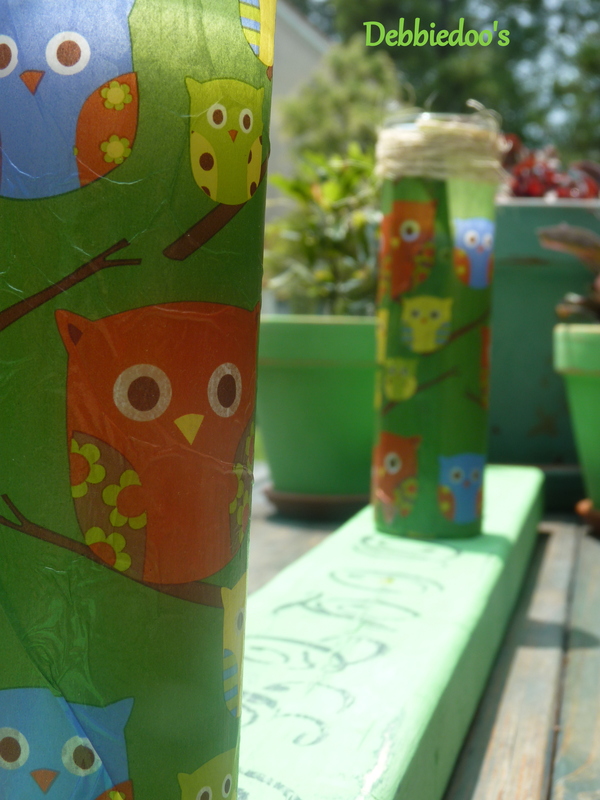 I have a gazillion of these candles & I never thought to embellish them. Great idea! I think I’ve just found my copy-cat project! ute cute cute! I love the paper. The little owls are adorable! Love the owls. So cute. I will have to go get some of those candles. That is the kind of project that’s just up my alley. Very cute! Next time I need candles these are in! Oh, I see the fall holidays coming up. Cute paper, dollar tree too? 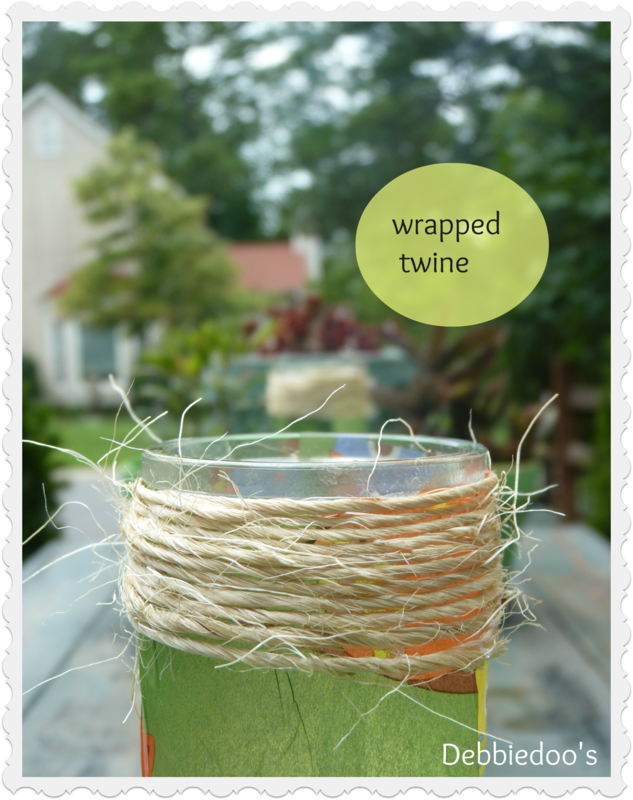 Really cute….love the twine on them! Have a wonderful day! Definitely a cute quickie project! embellished candle do make great gifts.. I like the twine around the mid top..
how cute!!! could do something like that with all kinds of different papers…for different occasions! When I saw this I just had to come over. I just got a post ready to go on my daughter’s owl themed bedroom that I posting tomorrow. She would love to make these. I will have to show her. Whooooo said you must do so many projects in a week? I can’t even get the pots and pans out of the sink! 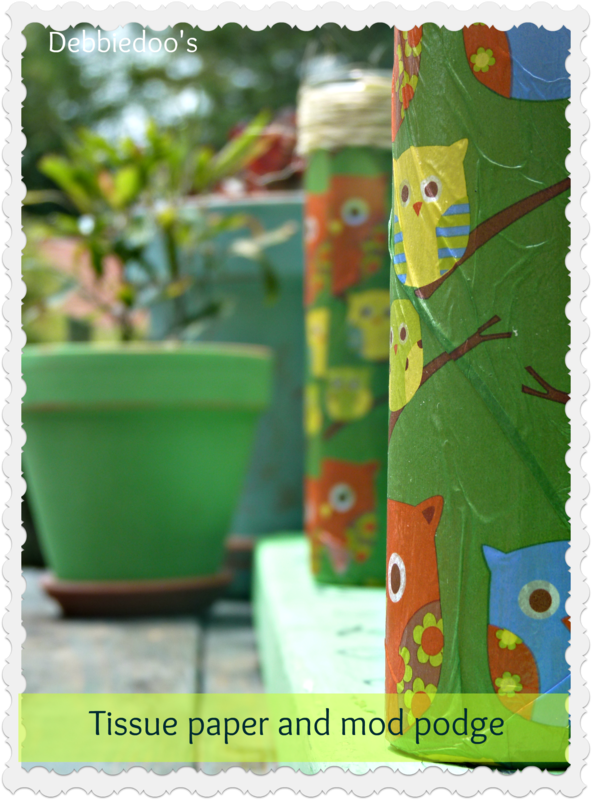 Tooo cute…I could sit and talk with you all day long but, if you will pardon me, I am on my way to buy two tall candles and tissue paper….O, and I already HAVE the Mod Podge so that means I am crafty, right?? I love those candles and that’s about the only thing I’ve ever bought at the Dollar tree! lol Would love to find that cute tissue paper though! You make such cute projects! Enjoy your day….and the weekend! Hugs! Very cute! I love those candles, too, and use them a lot. Would be great way to make personalized displays for birthdays. Thanks for sharing! Super-cute! Love your painted pots, too!